Thank you for your interest in volunteering at Sacred Heart Music Center! Sacred Heart would not be able to provide such an extensive selection of musical and artistic performances without the ongoing support of our community members. Our volunteers are essential in sustaining our facility and programming. We know your time in valuable, and want to ensure your experience as a volunteer at Sacred Heart is a both meaningful and enjoyable. Below you will find some basic information about our volunteering opportunities, and what the duties involve. We encourage you to take a few minutes to review and consider the “best fit” for your personal interests and skill set. 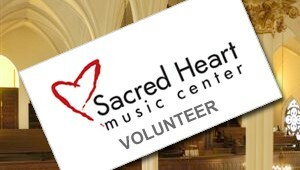 To get started please download the sacred-heart-volunteer-application and submit it to Sacred Heart, or contact our Volunteer Coordinator, Mary Hanchett by email at volunteering@sacredheartmusic.org. Concessions: Assists with setting up concession stand, selling food & beverages, handling money and clean up. Set–up: Assists with moving chairs, lighting candles and/or provide support with equipment, directions, gear and food for performers as needed. Lead Volunteer: Point of contact for the event. Manage volunteers and direct assignments for the performance. Web Page Maintenance/updates: If you have experience let us know! Inside light maintenance: Includes light housekeeping (empty garbage, straighten up areas, etc.) weekly or in coordination of events. General Description: Special projects such as painting walls or the ceiling are initiated throughout the year. A group of people is usually needed to perform such tasks. If you or a group (i.e. a church, community-based organization, etc.) would be interested in donating time for a worthy cause or wanting a community service project, this would and could help to fulfill our needs.